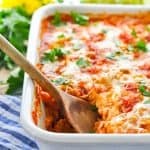 This stuffed cabbage rolls casserole is low on prep but big on flavor, so delicious and something the whole family will love! 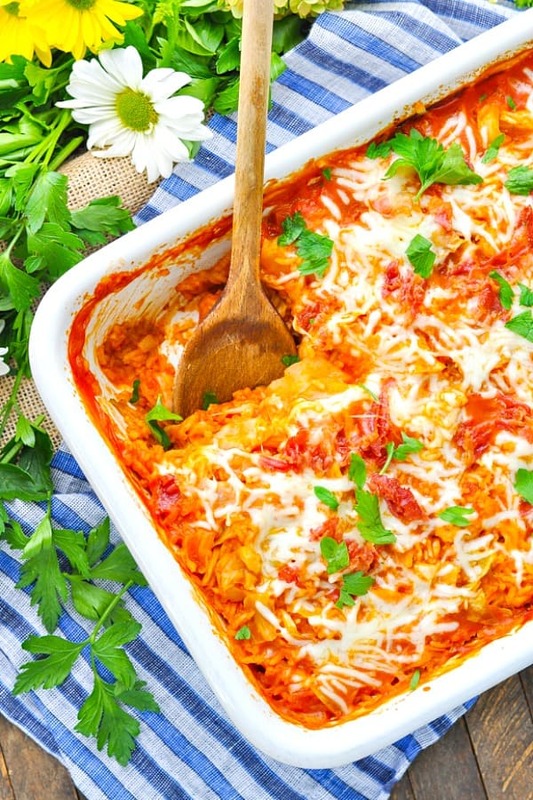 There’s no prep work necessary for this 10-minute Dump-and-Bake Stuffed Cabbage Rolls Casserole! It’s a shortcut twist on my Polish grandmother’s famous recipe, and it’s sure to become a tradition in your house as well! 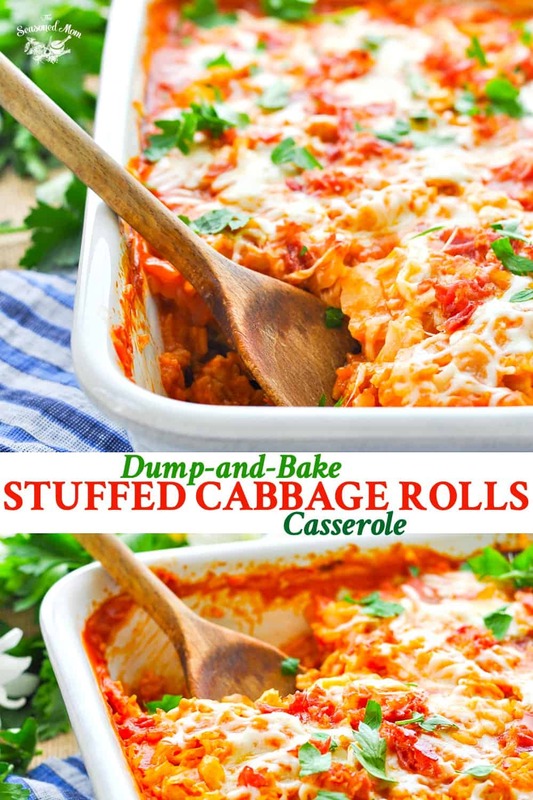 We all have those comfort food meals that remind us of our childhood, and Stuffed Cabbage Rolls is definitely one of mine. My dad’s mom is Polish, so I have been treated to her family’s traditional recipes for as long as I can remember. Potato pancakes (with potatoes that she insists have to be grated by hand), easy sauerkraut with crispy bacon, and her famous Stuffed Cabbage Rolls are the three that instantly come to mind. There’s just nothing that compares, and one bite of these dishes instantly transports me back to her table. My grandmother has shared her much-requested recipe for Stuffed Cabbage Rolls with my mom, my mom’s friends, and with me many times over the years. But here I am, 37 years old, with a family of my own, and I can honestly say that I’ve never made them before. But you know what? My cravings recently got the best of me, and I just couldn’t get my grandmother’s comfort food out of my mind. That’s when I knew that it was time to “modernize” her recipe and adapt the cooking process to suit my lifestyle. I was reluctant to give it a shot since I didn’t know if the final result would work, but I can confidently tell you — this Dump-and-Bake Stuffed Cabbage Rolls Casserole would make my grandma PROUD! You seriously just stir together all of the raw ingredients in one dish, cover, and bake for 1 hour! This is a really important note, though, so please listen up: since you’re using raw ground meat in the casserole, you want to make sure that it’s the leanest type of meat that you can find. My grandmother uses ground beef in her recipe, so if that’s your preference I would go with at least 96% lean beef. I used 99% lean ground turkey breast here (which works perfectly), but 99% lean ground chicken breast would also be a great substitute. 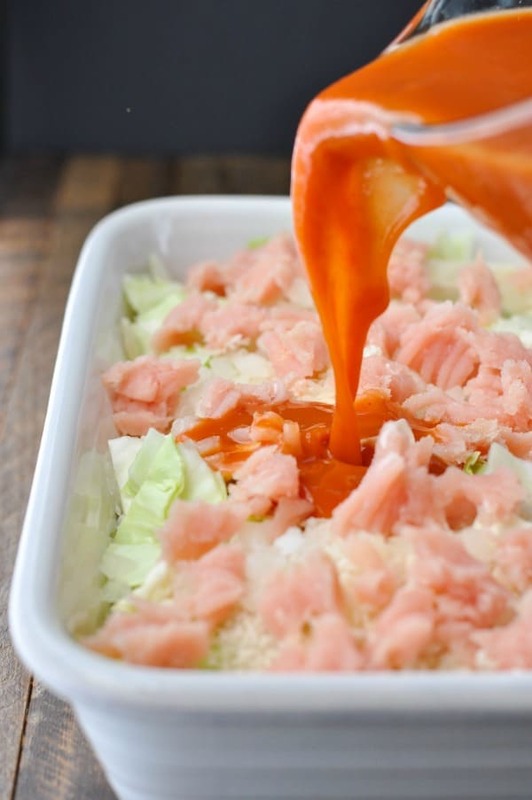 The key is to use the extra lean meat since you will not be pre-cooking it and draining the fat from a skillet, and you don’t want any extra fat in your casserole after it bakes. Makes sense? Great! The rest is easy-peasy. Just layer chopped cabbage, diced onion (I use frozen diced onion so that I don’t even have to chop it up), uncooked long grain white rice, and your uncooked meat with some seasoning in a big baking dish. Combine condensed tomato soup (just as my grandmother used) with beef broth (or chicken broth), and pour over top. It will seem like a lot of liquid initially, but trust me: the rice will absorb most of that liquid while it cooks. Cover the dish tightly with foil so that the moisture cannot escape, give it a stir after about 45 minutes, and top it with some chopped bacon and cheese during the final few minutes. The end result is a sweet, savory and rich combination that will bring a smile to any Polish grandmother’s (or granddaughter’s) face! By taking all of the same ingredients from her original recipe and transforming them into a 10-minute casserole, I feel like I just may have reached the pinnacle of my dump-and-bake cooking career! 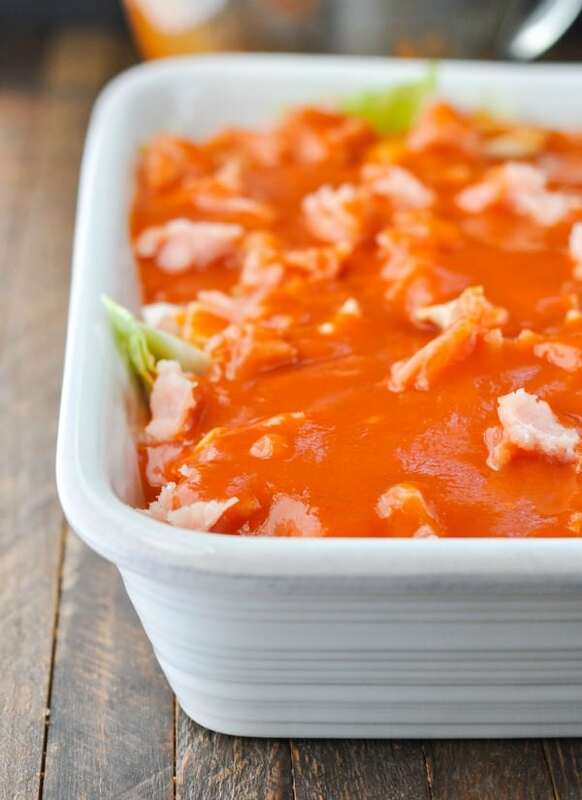 Whether you have Polish blood pumping through your veins or not, this is a one-dish meal that your family is sure to love! You can prepare this casserole in a smaller 8-inch square dish and cut all of the ingredients in half. The baking instructions remain the same. Preheat oven to 375F (190C). Spray a large 9 x 13-inch baking dish with cooking spray. 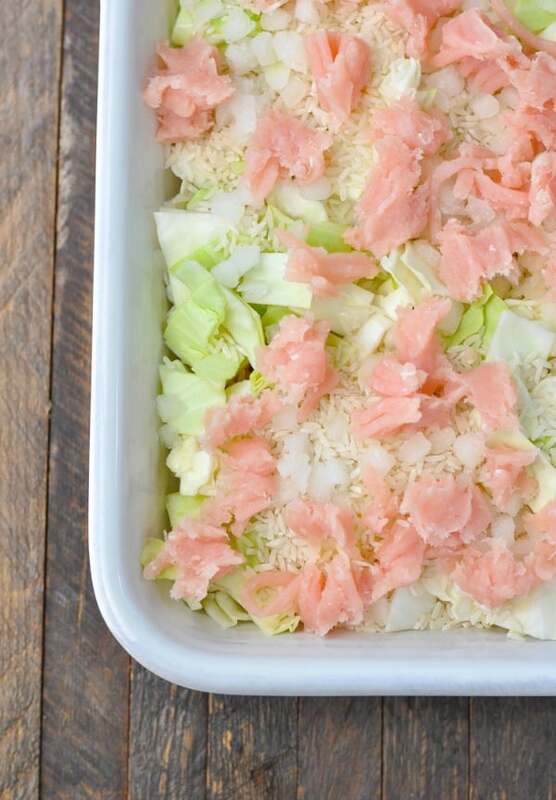 Place half of the shredded cabbage in the bottom of the prepared baking dish. Top with half of the uncooked rice, half of the onions, and half of the uncooked meat. You’ll want to break the meat up into small pieces with your fingers as you add it to the dish to make sure that it cooks in an even layer. Season with half of the salt, half of the pepper, and half of the garlic powder. Repeat layers once more, starting with the shredded cabbage. Sprinkle top of the casserole with remaining salt, pepper, and garlic powder. In a separate bowl, whisk together condensed tomato soup and beef broth. Pour soup mixture over the top of the casserole. Cover tightly with foil and bake for 45 minutes. Remove foil, stir everything, and cover with foil again. Return dish (covered) to the oven for an additional 15 minutes, or until rice and vegetables are fully cooked and tender. Remove foil. Sprinkle top of casserole with shredded cheese and chopped cooked bacon. Place in the oven uncovered for about 5 more minutes, or just until the cheese melts. Cooking Just for Two? You can prepare this casserole in a smaller 8-inch square dish and cut all of the ingredients in half. The baking instructions remain the same. My husband is Polish, so I have a feeling he would love this! Love how easy this is to make, too. I’ve had cabbage rolls before, but never made my own. Looks incredible! Sounds easy and yummy! Will have to try this! Blessings and thanks for all the great recipes you send us! I’m Polish and Mom made a lot of Polish recipes. that’s what you like. I just prefer using tomatoes. I’d like to thank you for aharing so many great, fast recipes!! I’ve tried some and love to experiment with things. Everything is easy, fast and tastes great!! I’m so glad that you’ve enjoyed the recipes. Thank you for following along with us! I recently made a shepherd’s pie which called for tomato soup and did not like it much—I’m sure the stewed tomatoes would be better than the soup. That’s funny — I’ve never seen frozen cabbage rolls for sale, but I know that my grandmother used to freeze her extras too. Definitely an option! I don’t care for rice in meatloaf, cabbage rolls, stuffed peppers. I get a box of saltine crackers, I take crackers 1-2 packs and smash them, mix in with seasoning add an egg,mix and bake about an hour. I’ve been looking for this recipe online for some time now and glad to find it here. It looks very close t the one my wife used t make. A little about me – I am 74 years old, 100% disabled and must fend for myself these days. Living alone, it is very hard to find truly easy recipes to make. I am not a picky eater but do tend to have my favorites. This one seems to fill the bill. Thanks for sharing. A simple workd of advice. It is not meant to offend, and is strictly my own point of view. I dislike cooking sites that feel they must post a dozen pictures of their lovely creations. One or two would suffice. I am here to find a recipe, not review your creative photography. I find this to be prevalent on so many cooking sites today, and it is bothersome to me. Again, just my point of view, but as a website creator and manager, I don’t think that a site should waste a person’s time with photography when they just wanna eat! Don’t take me wrong. Your photography is excellent. I just don’t want to wade through it to find the end results. I hope that my feedback doesn’t offend you in any way, for it is not meant to be offensive. Rather, I just wish that so many bloggers would decide whether they are a chef, or a photographer! Thanks for your feedback, Alden! Enjoy the recipe! I agree with Alden Smith that more than 2 photos wastes my time and would much prefer no more than 2. 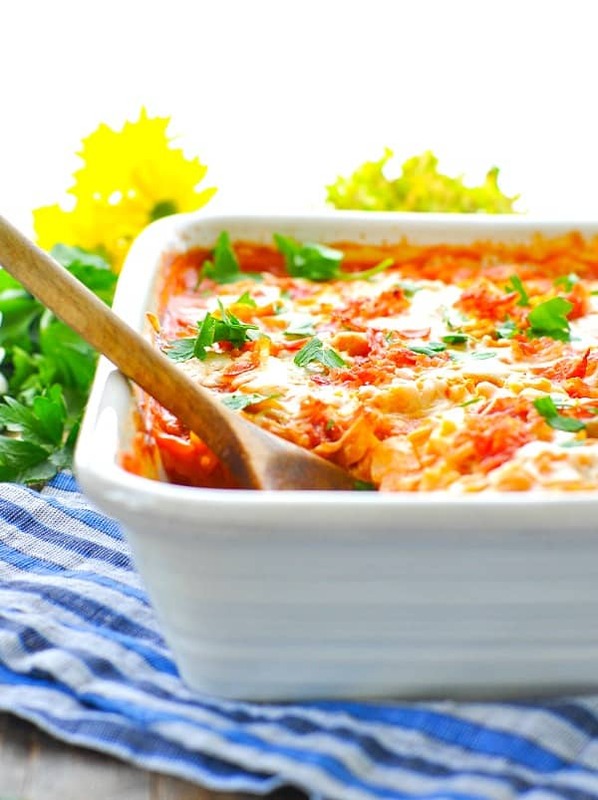 I recently made a “Dump & Bake Stuffed Cabbage Casserole” from another blog, and it definitely didn’t have the flavor which I grew up enjoying, since my Polish mom always made the ‘real thing’. I still make the real & time consuming dish sometime, but that quick & easy recipe caught my eye. Unfortunately, I was terribly disappointed with the final result! My mom always added canned Tomato Soup, NOT Tomato Sauce (which that other recipe called for). Your recipe is very close to my mom’s, so I’m sure it will be delicious. She always added a few strips of bacon on top for flavor, and baked the Cabbage Rolls in a covered (black speckled) roasting pan. Does anyone remember this kind of a roasting pan? I have several sizes, and they’re the BEST for roasting ‘everything’, and they’re also self-basting! If anyone ever finds one of these roasting pans in their mom’s or their grandmother’s attic, DON’T put them out, or sell them at your garage sale. These old roasters are golden, and you’d be very pleased how perfectly they cook a chicken or a turkey. 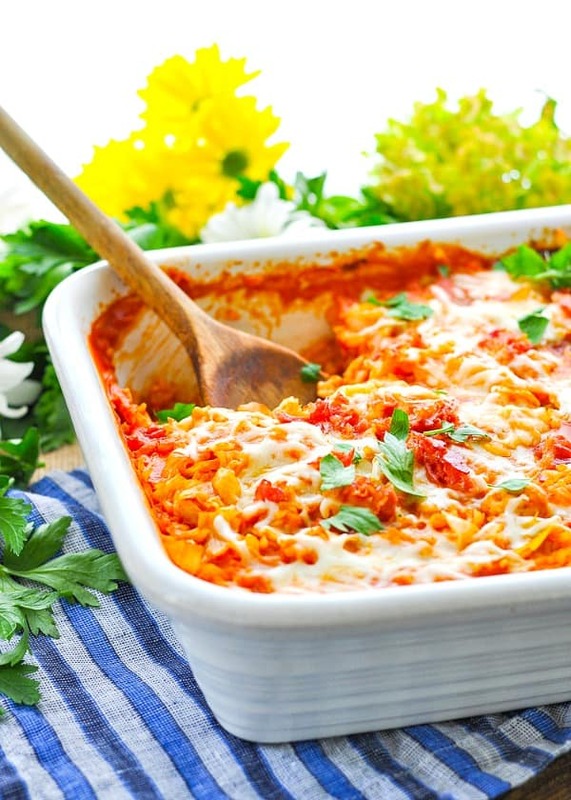 I hope that this casserole reminds you of your mom’s recipe! I got a free cabbage and wasn’t sure if I wanted to take the time to make cabbage rolls. I found this recipe and thought this would be much easier. Instead of frozen onions, I used a package of beef onion soup mix with 2 cups of water (in place of the beef broth). This casserole was DELICIOUS! It tasted just like cabbage rolls and even my picky teenage son ate with out complaint and said “mom, I like this”. 😁. Love the recipe. Agree with Alden Smith about pics. Only need one before cooking and one after. 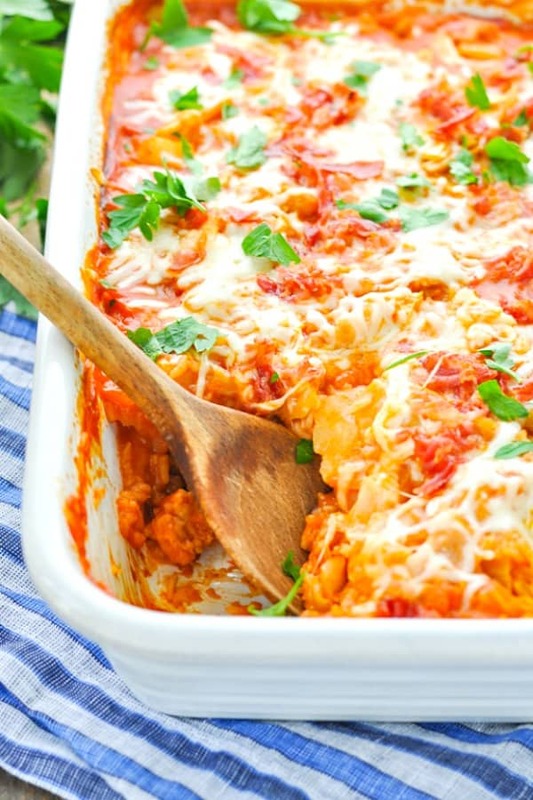 This looks deliciously easy and I’m excited to give it a test! Can you use instant rice? Thank you! Hi, Terri! The instant rice will not absorb nearly as much liquid as the regular rice does. As a result, you would have to significantly reduce the amount of liquid in the recipe to account for the instant rice. I just don’t know exactly how much liquid to suggest because I haven’t tested it with the instant rice. I’ve never tried Polish cabbage rolls before but the Italian ones are one of my favourite things ever and I can tell this would just taste amazing, definitely on the list of things to try asap! Thanks, Emily! I hope that you get to try them soon! This recipe was a fail! Not enough cooking time to get things done including rice and cabbage. Since I was not able to rate this recipe, it is as low as possible, not good. Hi, Darlene! I’m sorry that it didn’t work for you. I haven’t had any trouble getting the rice, cabbage and meat to cook through. Not sure what happened! I had the same issue. Part of the rice is cooked through and the most of it is completely raw. So off to the instant pot the entire batch goes to make sure this doesn’t turn to mush. I consider myself an excellent cook who can follow a recipe. I believe the problem with this recipe is that you do not stir the rice into the liquid prior to the initial baking and that you take the foil off after 45 minutes allowing critical steam to escape. 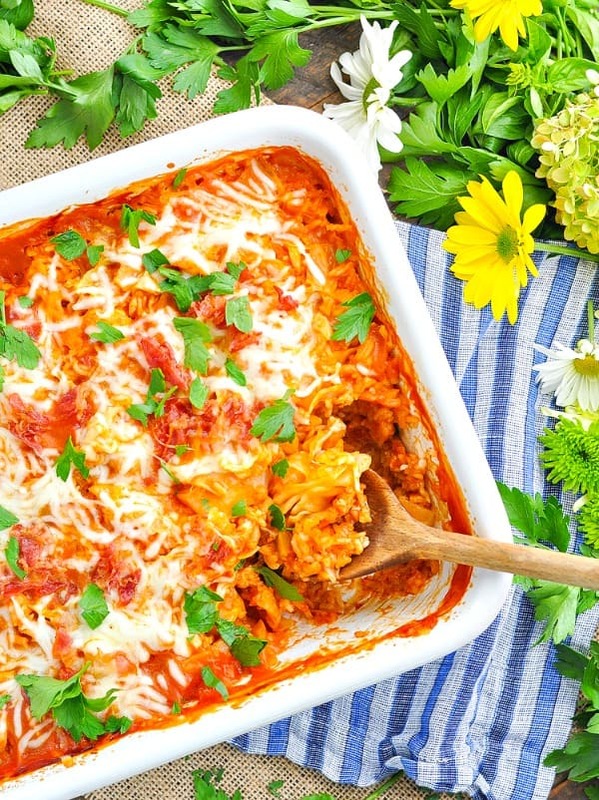 Thank you for sharing your DUMP-AND-BAKE STUFFED CABBAGE ROLLS CASSEROLE! It’s very tasty. 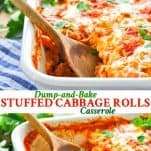 Years ago I had a cabbage roll soup recipe from a PBS fund raiser that was really good, but I’ve misplaced it, so when I looked on line & saw this casserole with no time spent rolling the cabbage, I was excited to try it! I was a sea level baby & transplanted to a higher elevation & have learned that some recipes require adjustments due to the elevation. Rice takes longer to cook & requires a little more water, something I forgot about until I checked for this for doneness, but just left it in longer & checked periodically & everything was fine. This is very flavorful! Thanks again! I love that! Thank you, Kris! Just a little note about the use of the tomato SOUP instead of tomato SAUCE in recipes like this is that the soup provides a sweetness that sauce does not give. I appreciate your recipe for that reason…i like a little sweetness in the use or the cabbage and meat. If i were to use tomato sauce I would definitely add br sugar.Thanks for sharing your lovely recipe! Exactly, Karla! 🙂 Perfectly said! I loved making this recipe. I love all your beautiful photographs, too. Keep em coming. What kind of crab apples can’t handle a few photos? I made the Dump and Baked Stuffed Cabbage rolls casserole for a pot luck luncheon at work today. It was a big hit and everyone asked for the recipe. I used 96% lean hamburger (beautiful and not greasy at all). I didn’t have an onion so I substituted some chopped grape tomatoes instead. I would make it with an onion next time. I had a few onions in the refrigerator but upon closer inspection I saw they were way past their prime. When I make this again I will use just one cup of rice because I think 2 cups overpowered the dish a little (though it was still delicious). I think if you are trying to mask the cabbage (which I was not) then keep the 2 cups of long grain rice. I used two cups of mozzarella cheese because that made it twice as fun. Loved using the creamy tomato soup. I think that is a better choice than canned tomatoes due to the creaminess that it brings to the dish. It gave it a buttery, unctuous quality. Anyway A++ Job well done! Hi, Laurie! Thank you so much for your kind note! If you decrease the amount of rice, just make sure that you decrease the liquid as well (or it might end up “soupy” after baking because there’s not as much rice there to absorb the liquid). And I agree — the tomato soup is the way to go! 🙂 Thanks again!